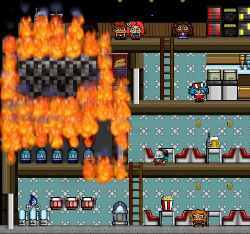 Take control of a robotic fire-fighter and stop the blazing infernos at different locations around town including the bowling alley, cinema, and gas-works. 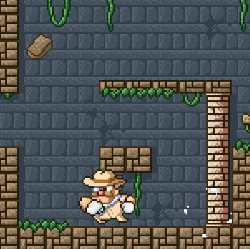 The levels literally burn down around you as you try and stop the fires from reaching explosive oil barrels and deadly petrol pumps. Watch out for fans that can spread fires through air ducts and be sure to rescue everyone. 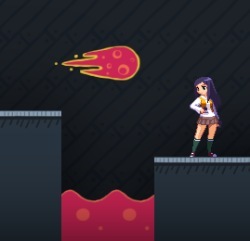 As you play, you can also collect coins to upgrade your firebot. 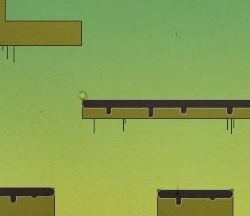 Use the WASD or ARROW keys to move around, jump, and climb ladders. Press the SPACE BAR to drop a sprinkler. Use the MOUSE to aim your hose and LEFT CLICK to spray. Aim your hose downwards, spray, and then jump to use your hose as a jetpack. Press R to restart and Q to adjust graphics quality. Click here to send Inferno Meltdown to your friends using your default email program.